If you’re into old cameras, you’ve almost certainly encountered some designed to use now-banned mercury batteries. So what can you do? In this article I will try to cover some light meter basics and offer suggestions for how to get your old camera’s light meter working with modern batteries. I’m going to try to stick mostly to layman’s terms and will provide links to more detailed descriptions of the science at work. Prior to the 1960s most cameras that had a built-in light meter used a circuit centered around a selenium photovoltaic cell. Selenium becomes excited when exposed to light and emits a small electrical current. Light meters use this current to power a D’Arsonval movement — a tiny electromagnet that turns a needle. The distance the needle moves is dependent on the current being produced. Because the sensitivity of the selenium cell is a known constant, the current produced for a given amount of light hitting it is predictable and the needle is calibrated to match the correct exposure on the readout. An array of tiny convex lenses that look like a honeycomb of bubbles help direct light to the photocell to get an accurate reading. Selenium light meters eventually give up the ghost. Sometimes they will tend to read inaccurately a bit before completely dying, but most often they simply stop working. Essentially, exposure to light just wears out the selenium, which is why it’s important to keep your camera covered in order to maintain a working selenium meter. By the early 1960s, though, selenium began to be replaced by cadmium sulphide (CdS) photocells. A CdS sensor is a light-dependent resistor (LDR) — a type of photocell. Photocells are simply variable resistors whose resistance to current flow decreases with increased exposure to light. So given a fixed input voltage, a given amount of light will produce a known current flow. This is then coupled to a needle similarly to the selenium meter described above. Maintaining a fixed input voltage becomes very important when CdS sensors are used in series circuits, which were cheap to build and reliable because mercury batteries were steady and commonly available. 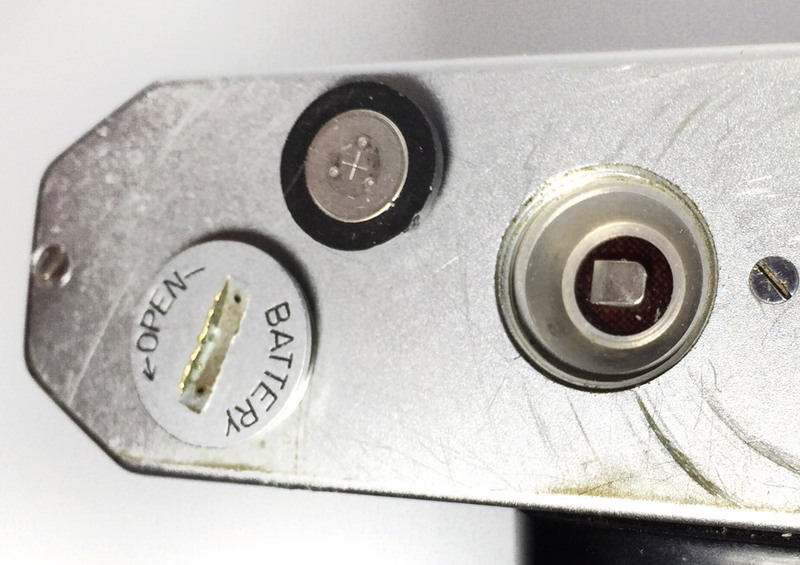 Mercury batteries such as the dreaded PX-625 maintain a very solid 1.35 volts from installation until their rather sudden death. Cameras with series-circuit CdS meters are problematic, though, because changing the input voltage changes the current flow for a given amount of light, and therefore the meter needle will read incorrectly. The needle typically reads low; remember the CdS cell’s resistance decreases with light, so a higher input voltage will result in a higher output current for the same resistance, pushing the needle down further than it should. Some people seem to think that you can compensate by adding or subtracting a stop or two of exposure by adjusting the film speed setting, but that’s wrong. The problem is that when you calculate exposure you’re dealing with an exponential increase in light — that is, one stop of light, or one exposure value, represents an increase of 100% or decrease of 50% in the amount of light being captured. In other words, each stop is double the light of the next lower stop. Increased voltage produces increased current at the output of the CdS cell, but the photoresistor’s output curve is non-linear — it’s logarithmic. A given input voltage is divided by the ohms of resistance in the variable resistor to determine current. Increasing the input voltage increases the output current, but because the output current of the CdS cell is a logarithmic curve, when the curve moves, the distance between relative points on the two curves increases logarithmically as well. Ultimately what this means is that the less resistance the photocell produces (more light), the further the output is from being the same for a higher input voltage. Put simply: the less light the meter sees, the more similar the readings will be for two different input voltages. Hence using a 1.55-volt silver oxide battery will be close to accurate — maybe underexposed by a third of a stop or less — in low light, but potentially wildly inaccurate in bright light. By wildly I mean it could read several stops underexposed, depending on the light and the sensitivity of the CdS cell. 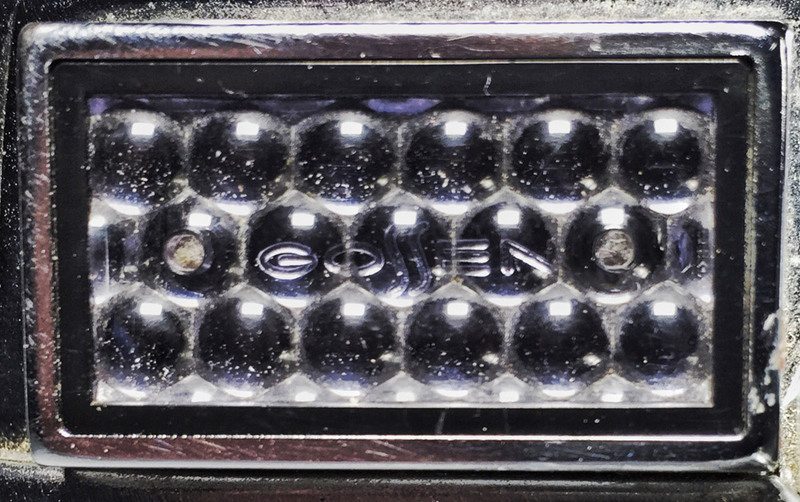 Silverbased put this to the test with two cameras and a known-good surviving mercury battery. Because of that inaccuracy you can’t just toss a silver oxide battery in and go. And you certainly can’t use an alkaline (usually manganese dioxide) battery because the discharge curve is all wrong. Oh, and remember you can’t use mercury oxide batteries because they contain nasty stuff and have been illegal in Europe and the U.S. since the 1990s. That’s why you’re here. The discharge curve describes the actual voltage output by a battery during its life cycle. When a battery is new and not installed in anything, its chemical process has a specific potential output. Once installed, the actual voltage is generally a little lower than that, and as the electrolytes inside the battery become exhausted its output may decrease even further. The curve of a mercury, or mercuric oxide, battery is very flat: it is a 1.35-volt battery that almost instantly draws down to 1.3 volts on installation, and stays at almost exactly 1.3 volts for nearly its entire life, dropping to an unusable voltage quickly and therefore remaining steady for about 95 percent of its life cycle. 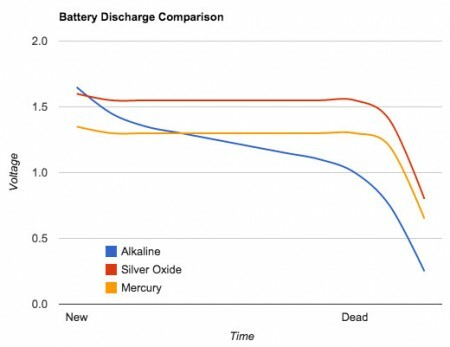 Silver oxide batteries follow an almost identical curve, starting at 1.6 volts and dropping to 1.55 volts in operation before suddenly dying. Alkaline batteries are much more like rechargeables in use, though. A 1.5-volt alkaline draws down to 1.4 volts almost immediately, and then continues more or less steadily downward through its life cycle until it hits about 1.1 volts and then rapidly declines. Below that level the battery is considered dead — think of your Walkman playing so slowly that Freddie Mercury sounds like Tom Waits. Mike Willegal extensively tested battery solutions for his Minolta SR-T cameras and has some good technical information about the different discharge curves. Willegal also describes the effect of different loads in relation to the logarithmic curve of the photocell’s resistance and explains his homemade adapters. So you can see that a design that relies on a known input voltage suffers when the right voltage is no longer available. Some manufacturers foresaw this deficiency, or decided to eliminate the possibility of inaccuracy completely, and used a bridge circuit. A bridge circuit is a parallel circuit that measures the current output from the photocell as it relates to the same current under a known load (a fixed resistor). By putting the meter between these two sides of the circuit, the meter needle essentially can be powered by the difference in current, meaning that while the meter may not be spot-on given different different input voltages, at least the curve will be correct. Therefore cameras designed with a bridge circuit can usually use a silver oxide battery — remember they still need the very flat discharge curve to maintain consistency in their reading — but you still may need to compensate for a little inaccuracy (from one third to one stop underexposed, it seems to generally be) by adjusting the film speed a little. I tried this in my Pentax Spotmatic SP1000 and got decently-exposed photographs with ASA 200 film by setting the film speed to ASA 100. Bridge circuits are described in great detail in this description of the Praktica TL series’ meter circuitry. There are several ways to cope with the problem of the mercury battery. Some are pretty easy and others are pretty hard. Sunny 16: Learn the Sunny 16 rule and use it. It’s most useful outdoors, but it will help you develop an innate sense for exposure. 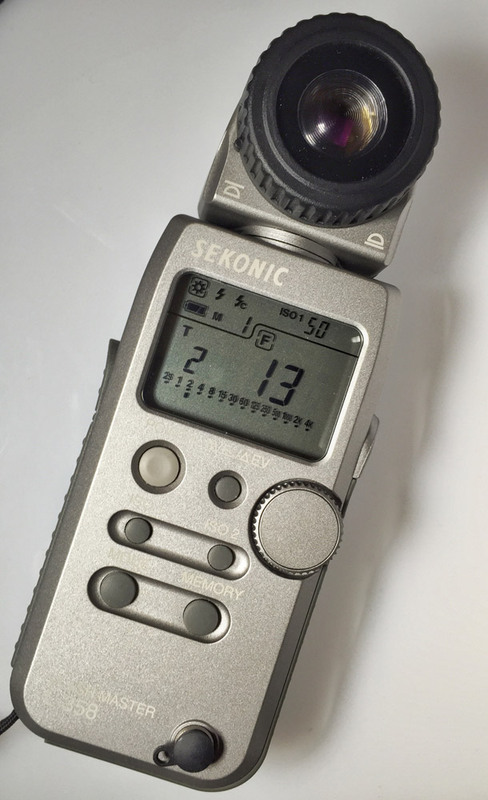 Handheld: Buy a handheld light meter, such as the Sekonic L-398A, or Film Photography Podcast favorite the Gossen Luna Pro F. I have a Sekonic L-358 which has served me well, but has been discontinued. App: Download a light meter app for your smart phone. I use the Light Meter Free app on my iPhone 6 all the time. Known good: Use the meter in another camera that doesn’t suffer this problem. I routinely use the meter in my Nikon FM2 to backstop when I’m carrying it and testing another camera. Free option if you have one. Digital: If you’re not a total film purist, you may have a digital camera you can use to meter. Also potentially free! Heck, you could even just toss an alkaline 625A battery in there and shoot with Kodak tri-X 400, trusting in the film’s amazing latitude to make most of your shots useable. I don’t call that a real solution, though. Wein Cell batteries replicate the voltage and, more importantly, the steady current output of a mercury battery. They use a zinc-air process and are made for hearing aids. Because of that second component they require access to fresh air, so if your battery cap doesn’t already have a breather hole in it (many do), you may need to drill one. It doesn’t need to be very large — 1/16″ will be plenty. 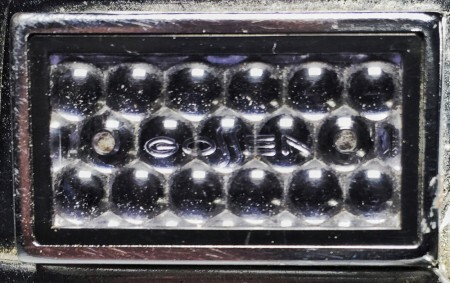 Wein Cells come in several sizes, such as the very common PX-625 size that’s shaped a bit like a mushroom, or the PX400 size that the Pentax Spotmatic is designed for. All zinc-air batteries come with a plastic tab that seals out oxygen until you remove it. Once removed, the reaction has started and the battery’s countdown to death is running whether you use it or not. 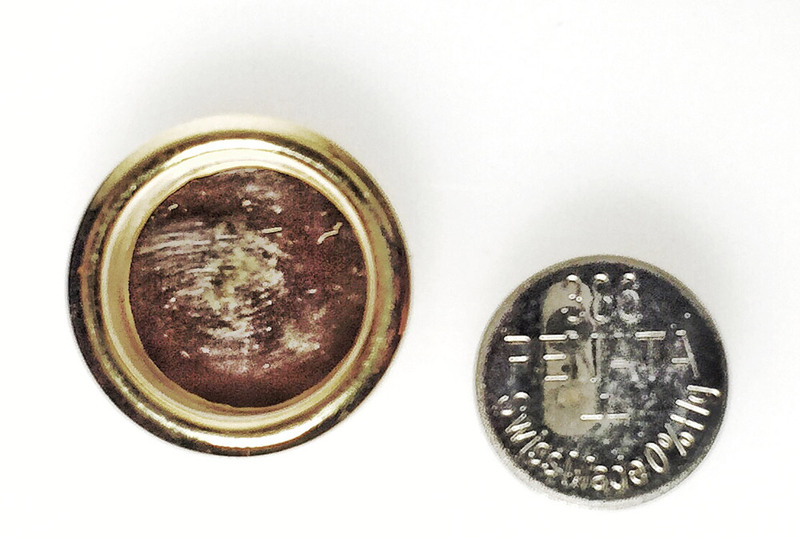 The PX-625-sized Wein Cell can be expensive, and so some people have developed ways to use cheaper zinc-air batteries inside the hollowed-out shell of an alkaline PX-625 battery. See “Stack solution 1” on page 2 of Frans de Gruijter’s guide for more. You can make an adapter out of a piece of insulated copper wire curved into a donut shape in order to use a cheaper 675 zinc-air battery, or cut a sliver from the end of bit of plastic tubing. 675 batteries are very slightly higher in voltage under load than a Wein Cell, but we’re talking .02-.03 volts — and they cost maybe $1 apiece. Another problem with zinc-air batteries is that they don’t last very long. Because the reaction with the air is constant, the battery simply dries up, and the speed at which this happens can vary with the temperature and humidity in your area. Most people say they last something like 3-5 months, though in the hot, dry Colorado summer I’ve had them die in more like 3-5 weeks. A Wein Cell worked just fine for me in my Minolta SR-T200, but ultimately the cost and short life of the batteries left me in search of another solution. Silverbased suggests that if you choose any zinc-air solution you might want to turn your meter on for more than a couple seconds before taking a reading. Some cameras with bridge circuits can use a silver-oxide battery with an adapter. Some cameras with a bridge circuit can use a tiny 389 or 394 silver oxide battery centered in a rubber O-ring. You may need to bend the bottom battery contact up a bit to contact a short battery such as a 389 or 394 battery, but the convenience of using batteries available at the supermarket or drug store is well worth it. Some cameras can reportedly be recalibrated to read correctly with a higher-voltage battery. This may be performed by a camera repair professional, and some may include it in a full service an older camera if you send it in for a CLA. You can also do the job at home if you find a good guide. Mike Willegal’s article on tuning up your Minolta SR-T light meter includes a section on calibration that may help you get started. Some cameras with bridge circuits can be calibrated to be completely accurate by adding resistors to each side of the meter circuit, as described in this thread about improving a Pentax Spotmatic. This one sounds relatively easy, though I haven’t yet tried it myself. It involves installing a Schottky diode in your camera in series with the positive terminal of the battery. In order to complete this operation, which is described in detail for Minolta SR-T cameras by The Rokkor Files, you will need to remove the bottom cover of your camera body and cut into the positive lead from the battery holder. Solder the tiny germanium diode into the wire in series so that it can step down the voltage from a silver oxide battery (you’ll need one of those to maintain the flat discharge curve, remember), being careful to install it the right way around and not overheat it during soldering. There are several commercially available adapters that include a Schottky diode in an empty PX-625 casing and use a smaller battery to power the camera and run the meter. The MR-9 adapter from CRIS Camera is $36.99 (includes shipping) and is a very popular solution if you can afford it. There are slightly cheaper variations such as the ones offered by eBay seller pratedthai, which are only $26 after shipping. I bought one from pratedthai and tested it in my Olympus 35RC, and decided that it appears to work very well. I was impressed with the apparent quality of its design and construction, the relatively fast shipping (all the way from Thailand), and its lower price. If you’re the daring type and have confidence in your ability to work with your hands, you can make your own adapter by hollowing out a cheap alkaline PX-625 battery and installing a Schottky diode yourself with a bit of cardboard insulation and copper foil tape. Frans de Gruijter wrote an extensive article that covers this solution in great detail. Check out pages 6-8 of his article. I have not attempted this, but it does not look too difficult conceptually. I expect it will require some patience and fine motor skills, however. This battery subject has been covered in a multitude of ways by a ton of people. My goal here has been simply to sum up the situation and outline possible solutions when you encounter cameras designed for mercury batteries. In order to support my article and provide more information, I’ve loaded this article with links to the resources I’ve found handy both in working with my cameras and in preparing this story. If you want to dig in even further, Google will provide you more resources than you could imagine.